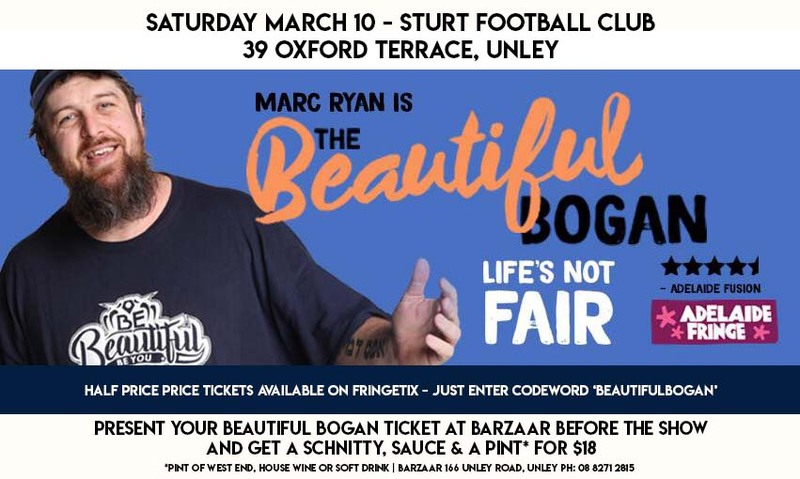 Marc Ryan The Beautiful Bogan Fringe show features this Saturday 8pm at Sturt Football Club – 39 Oxford Terrace, Unley. Tickets still available and you can get yours for half price by entering the code word ‘beautifulbogan’ through FringeTix. Looking for a meal prior to the show? Visit the team at BarZaar (166 Unley Road) located just down the road, show your Adelaide Fringe ticket and receive a schnitty, sauce & pint for $18.